You are here: Home / Dubbo? Done! Ah, touring. There’s nothing like it. Even just an “overnighter” can fan the flames of touring frenzy. Spent last weekend on the road doing a weekender to Dubbo and back. I had sort of planned a weekend away myself as the better half would be absent doing her art stuff and so wouldn’t miss me at home. 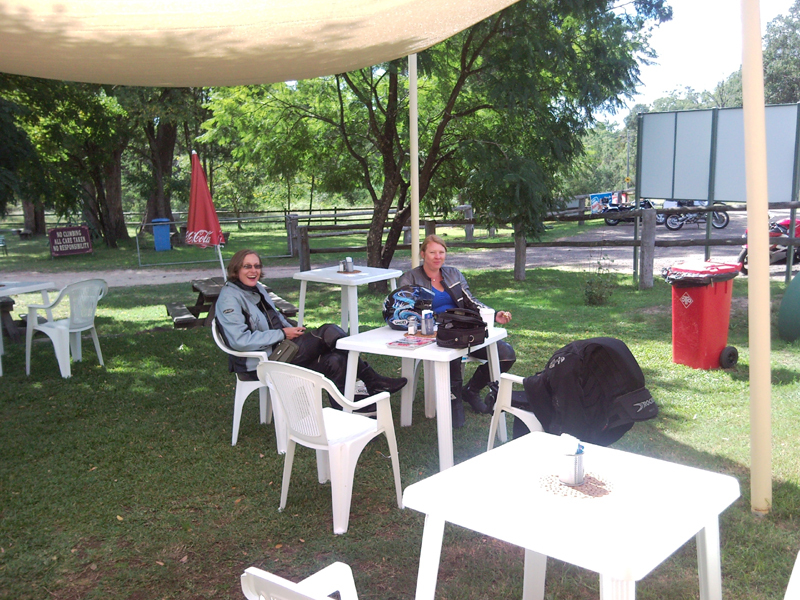 But when I found that my good friend, Taina was planning a weekend ride to Dubbo, the opportunity was too good to miss. So, bright and early Saturday morning (should have been earlier except for gumby-features having to go back home and get his mobile phone), we gathered at Northgate Maccas ready to go. 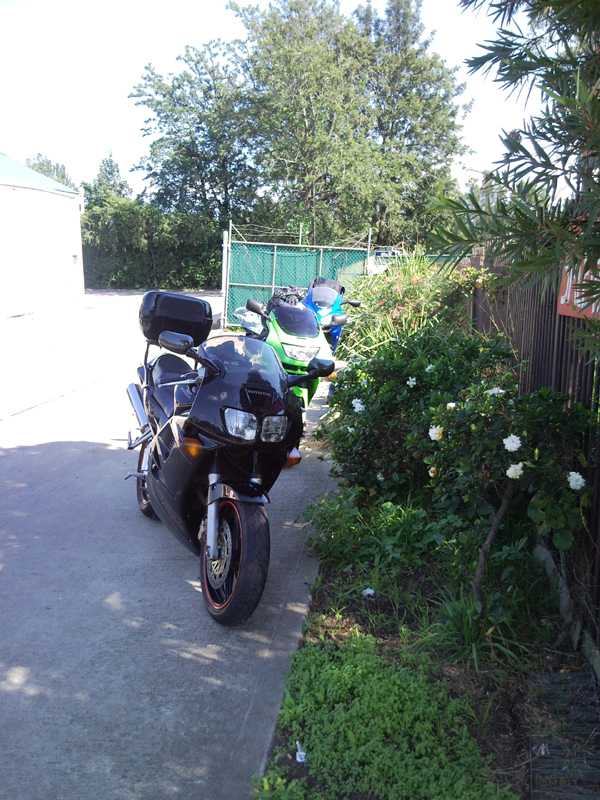 Joey had decided to join Taina on the ride so that made three of us, a great number for a short tour. Up the highway, Picton, and the back road through Silverdale, Mulgoa, etc and out onto the main road at Glenmore Park. No traffic and a great opportunity to get into touring mode. I was reminded of the signature of one of my friends on ozvfr, “It’s a tour, not a race, but don’t get in the way when I’m touring.” Made it to the Caltex at Wilberforce in an hour and fifty; excellent. On to the Putty, negotiating the usual hazards including a group ride that included two girls on GPX’s whose lines on the corners were interesting to say the least. Both must have been learners or early “P”‘s but no plates in evidence. Oh dear. And we would have to catch them on the Colo Heights, now wouldn’t we? See my comment above about touring..
Halfway House for morning tea and a drama that would only become one quite some time later. Then it was on to the Ten Mile, anticipation building the closer we got. Sad to say, it was probably one of the least enjoyable runs I’ve ever had through the Canyon. Traffic, cars and trailers and just everything to stop you enjoying this great patch of road. Oh well, on balance, I’ve had way more good runs than bad in the last 35 years so I guess you have to take your lumps. Just south of Singleton we cut west on the Golden Valley Highway and headed to Denman through Jerry’s Plains. 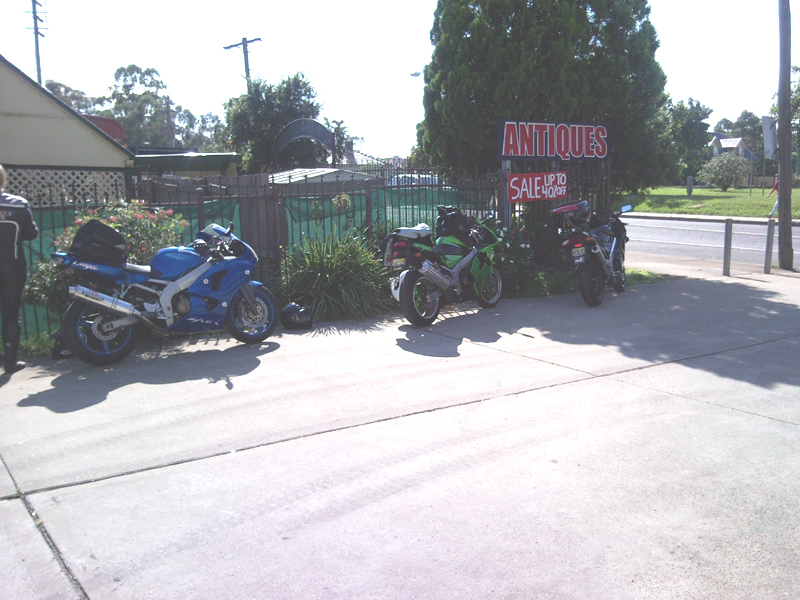 Right in the main street and on through Sandy Hollow and Merriwa for a fuel stop. And it was between Sandy Hollow and Merriwa, some 150kms past the Halfway House, that Taina realised that she had left her handbag (purse, credit cards, money, mobile phone, you know the deal), back at Howes Valley. What to do? I was all for turning back and retrieving the bag and making up an ad-hoc Hunter Valley tour as a replacement, but Taina wanted to push on and do Dubbo. So, we stopped at the Tourist Information office at Merriwa and rang the Halfway House to be assured that the bag had been handed in, intact, and would be kept safe until Taina could return and retrieve it. 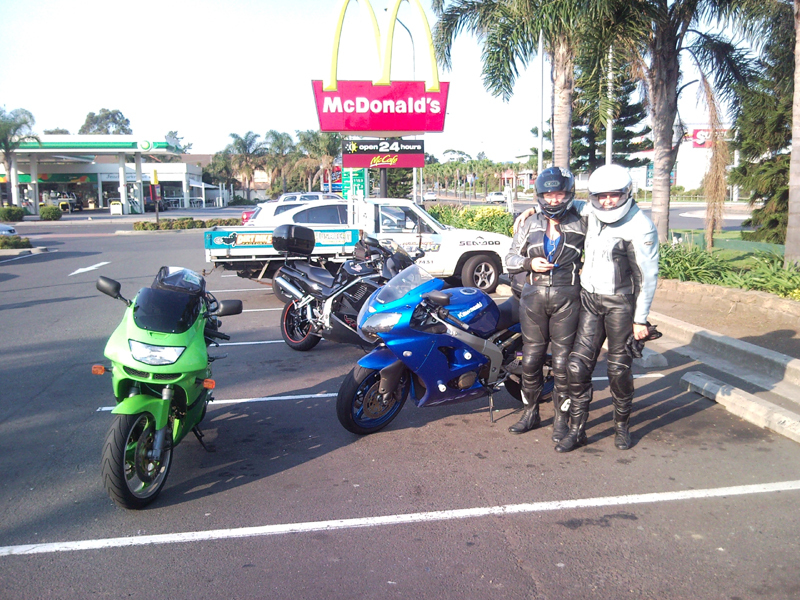 So, we fuelled up (thanks to Joey) and pushed on to Dubbo. Now I have to say that, once you get past Merriwa, the roads aren’t exactly grandly interesting. Lots of long, straight tracks leading off into the distance don’t exactly inspire. The 200kms between said centres certainly seemed to take much longer than 2 hours to traverse. Added to the this was the increasing discomfort I was feeling from the osteo in my left hip that flares up from time to time. Why DID it choose this weekend to act up?? Anyway we made it into Dubbo before nightfall and, thanks to a couple of friendly taxi drivers were directed to the most excellent Castlereagh Hotel. Now, if you are going to Dubbo and are planning on staying, this is the place to stay. Why? A single room, WITH its own bathroom and toilet, AND a full, hot breakfast for $50 a night, and that in the middle of school holidays. 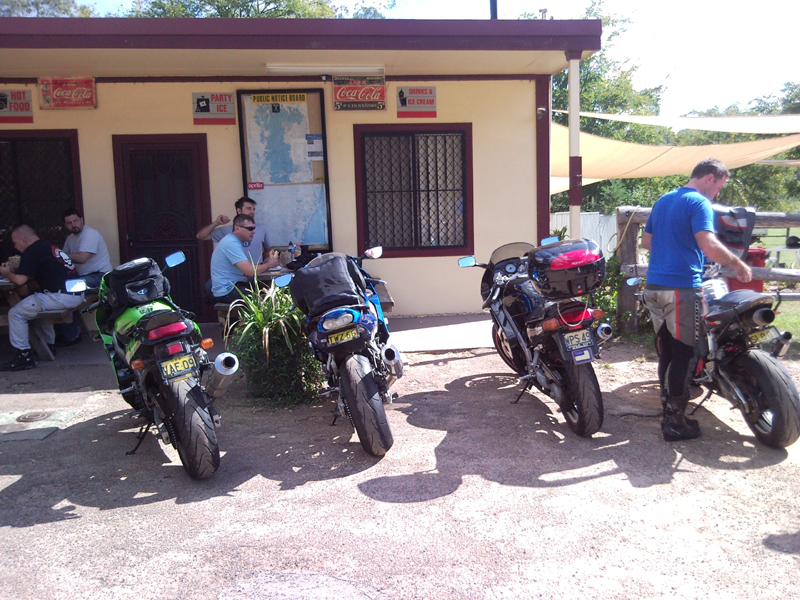 A delicious, home-cooked hot breakfast prepped us for another day in the saddle and we headed out just before 0800. There was some urgency attached to the morning’s ride as I was hoping to make it to Bathurst by 1000 to meet up with a good friend who was going to be at the NMRM at that hour. More of this side of the trip in another post, it deserves it. By dint of somewhat massaging the speed limit, though a good part of the highway is actually posted at 110km/h limit, we pulled in to the car park at 1004. Made it. 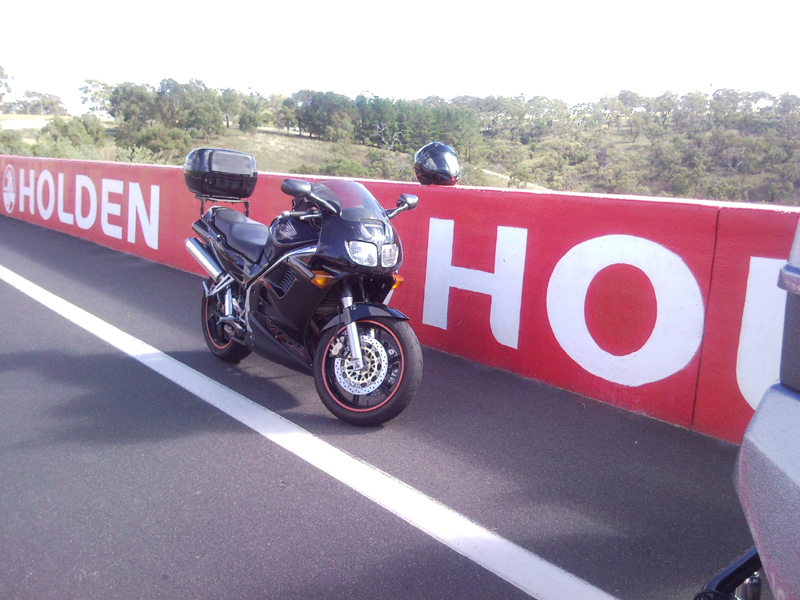 While I took care of my responsibilities, the girls explored the museum and then all three of us set out on a leisurely lap or two of the fabulous Mount Panorama circuit. Here it was decided that Joey and I would head on home while Taina did the BLoR across to Kurrajong and back up the Putty Road to retrieve her handbag. Halfway between Bathurst and Lithgow the gloom gathered and it became obvious that we were in for rain. The girls hadn’t brought ww gear (naughty) but I put mine on and was almost immediately glad that I did so. Hah, I just typed “almoist”. Unfortunately, that’s what both of the girls were to become before too much longer. We farewelled Taina at Lithgow and headed into the rain and the gridlock of traffic that is the GWH on a Sunday afternoon. Being an old stager, I hopped into the Honda Highway as soon as the traffic stopped moving and passed hundreds and hundreds of cars locked solid in traffic through all the little Blue Mountains villages (that, I’d have to say, didn’t look nearly as attractive through the fog, mist and rain.) Joey has had a couple of dodgy experiences navigating the breakdown lane so she stayed in the flow and fought it all the way down the mountain. I am filled with admiration. At the bottom of the hill at Lapstone I waited till Joey caught up and then we cut out and headed back down the Mulgoa Road. By now the rain had stopped, but Joey was soaked to the skin and frozen, so a stop at Peppercorns (highly recommended coffee shop, btw) was most welcome. Then, we scuttled on down to Picton through more patches of rain only to be greeted by the usual pea-soup once we’d crossed the Hume and got onto the Picton Road proper. From here on it sheeted down and I didn’t think it could get much worse, but, at the bottom of Ousley it got MUCH worse so the last part of the journey was as trying as you can imagine it to be. 1226 kms in two days, the big one being Saturday where we did 758kms. I can’t say I’d go back to Dubbo in a hurry as I much prefer twisty roads on my tours, but, since the last time I toured there was in 1988, it was good to reacquaint myself with the western city. A big thank you to Taina for inviting me along and to both her and Joey for being great travelling companions. I had checked the forecast for Sunday in Dubbo, which was fine, the Illawarra expected a shower or two, but the rain in the Blue Mountains was unexpeceted. In future I won’t leave the house to tour without my wet weather gear. That was one bugger of a lesson! Great report tour-buddy! Must do it again…South?? ?